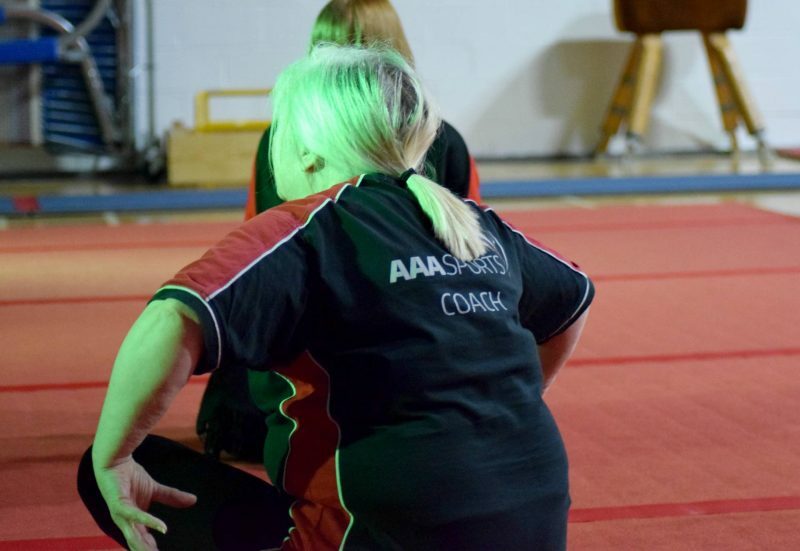 AAASports are the largest Gymnastics, Trampoline and Cheerleading club in the North of England. 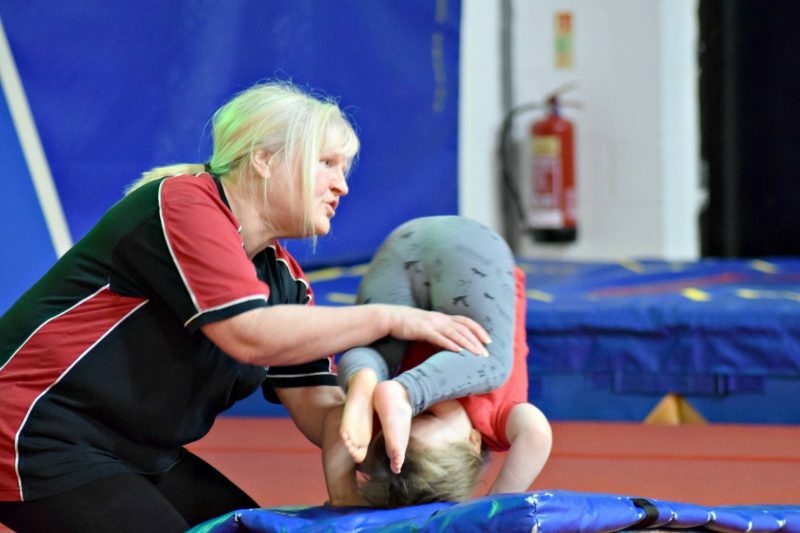 Based in Sunderland, they launched in 2007 and run a range of classes such as gymnastics, trampolining and cheerleading to suit all ages. 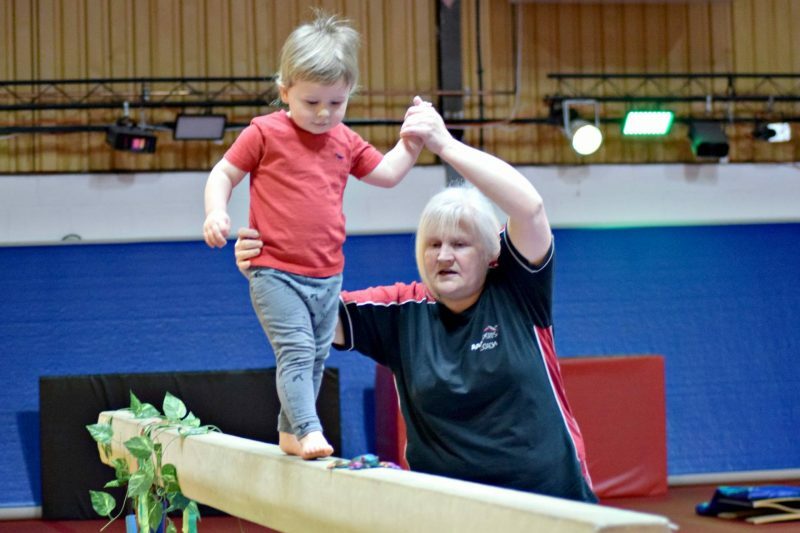 The coaches help younger children learn basic skills on the bar, beam, floor and vault. This helps them to building up strength and flexibility through classes that are themed. The classes are suitable for children aged 2 1/2 and above. 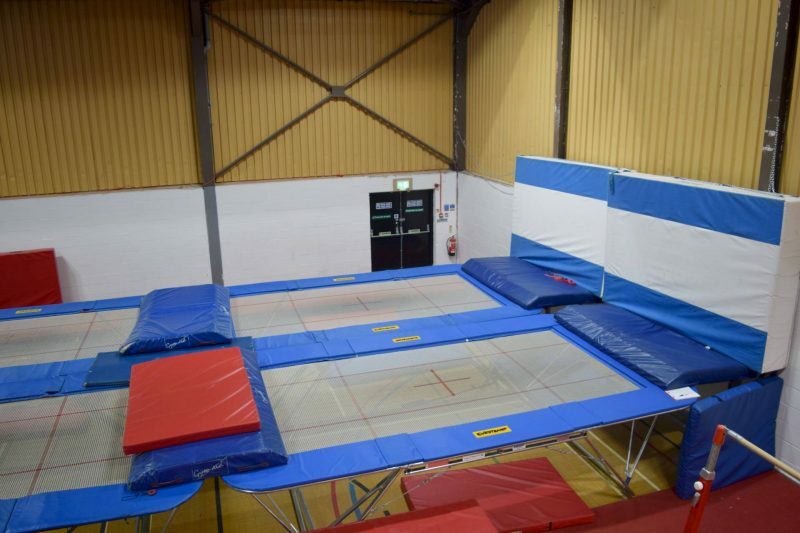 Children learn simple trampoline skills from the coaches which helps them develop balance and coordination. 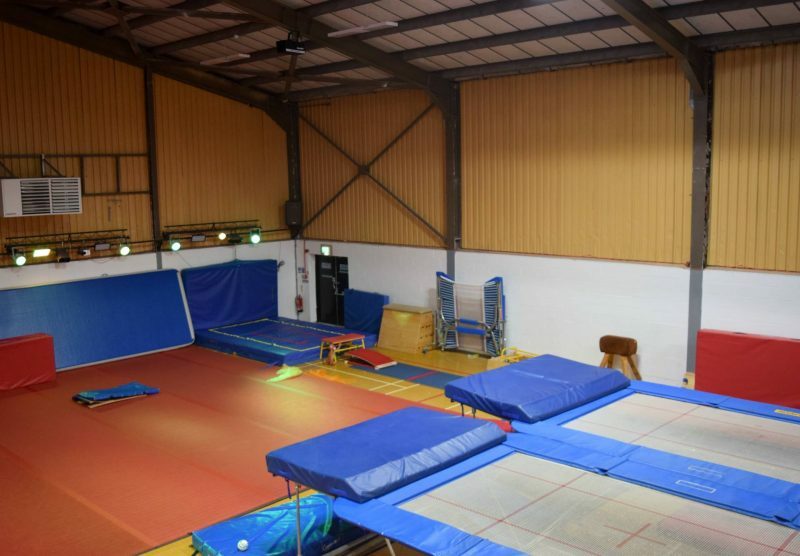 The trampoline classes are also aimed at children over the age of 2 1/2 years. 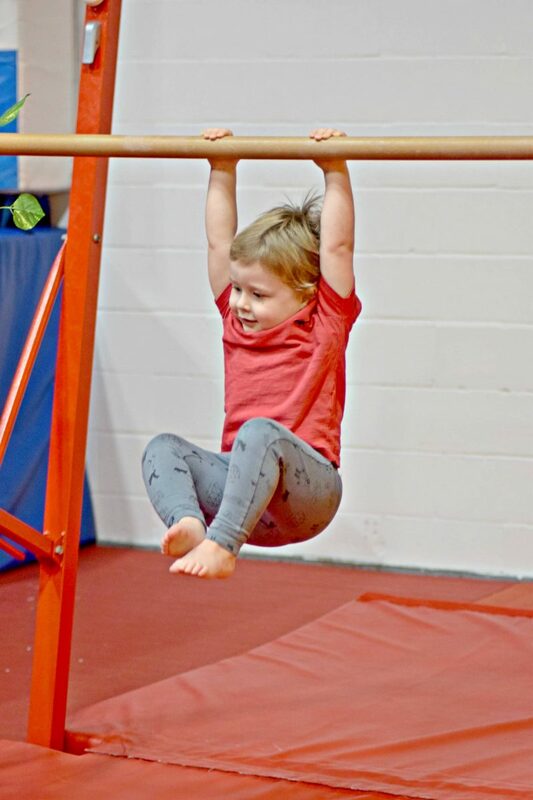 Children are able to move between both Gymnastics and Trampoline activities during the open classes along with their parents. This is suited to children 18 months to 3 years. 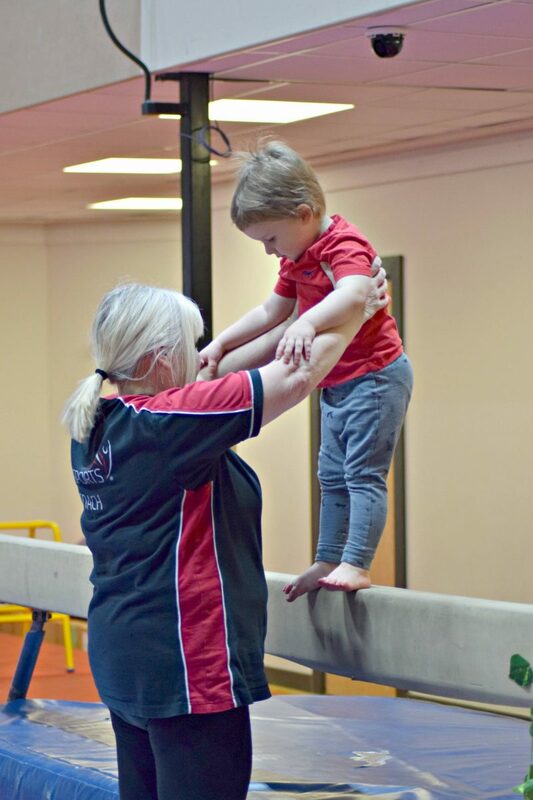 We were recently invited along to try out one of their pre school gymnastic classes with the little man who thoroughly enjoyed himself. When we arrived I was surprised by the size of the building. 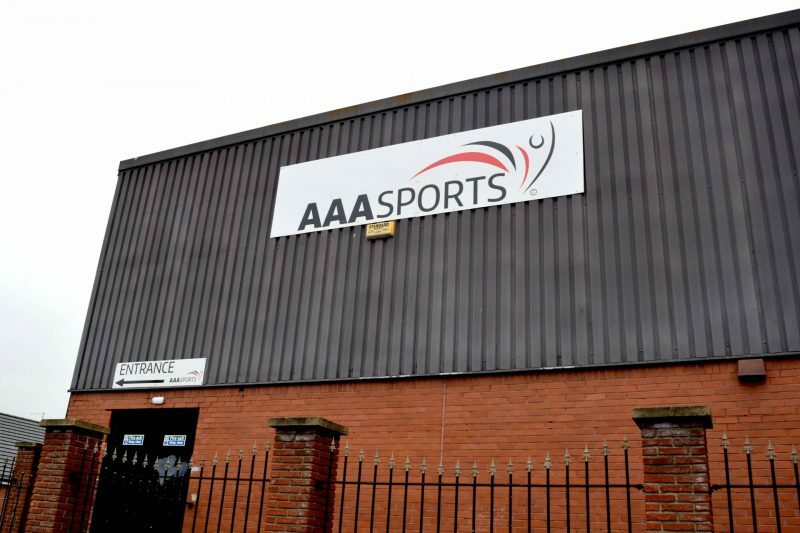 I’d been expecting an area in a community centre or something similar but AAASports have their own large unit filled with equipment with plenty of free parking in the nearby streets. 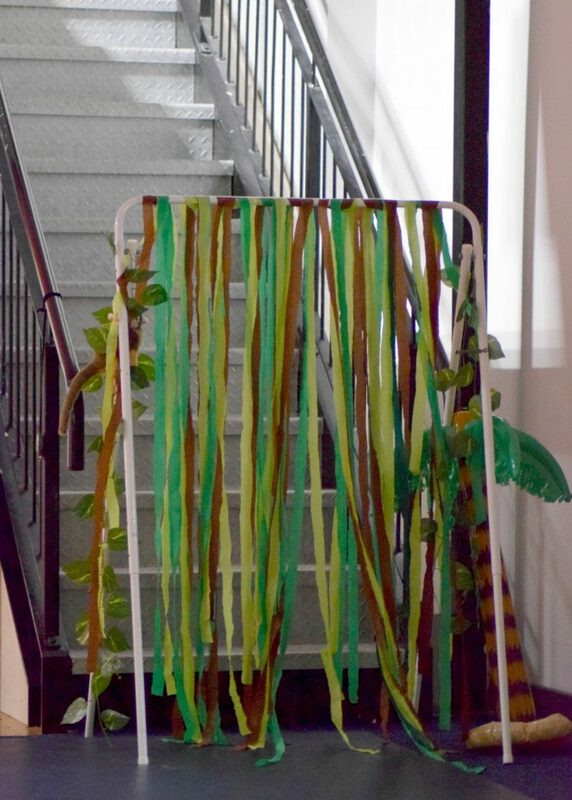 Before the class we left our shoes and bag upstairs on the balcony above the gym, before heading downstairs and through a green jungle themed entrance to start off our class. The children and adults gathered on the mats and listened to a short story read by the coach – Karen, about the animals in the jungle ( the theme of the class when we visited was ‘the jungle’). Karen was really friendly but had an authoritative tone which meant, despite the children being young, they knew they needed to listen to her and follow her instructions. During the story, the children were encouraged to pretend to be the animals that were mentioned on each page of the story which was a fun and easy way for them to warm up. The class focused on four areas : – bar, beam, floor and vault all of which aim to help younger children build up strength and flexibility. The class we attended started with floor and the children moved round the mats in a circle, participating in separate activities (a little bit like child friendly circuits). Each child started at a different station which meant no queuing or waiting ( which we all know toddlers aren’t a fan of) and moved around the room whilst trying out the activity at each station. Some of the activities included curling up and pretending to be a snail within the diameter of a hula hoop and learning how to tuck up correctly and do a forward roll down a springboard. The little man loved doing forward rolls, he does them whenever he can at home so it was great so see him shown how to tuck his head under correctly. 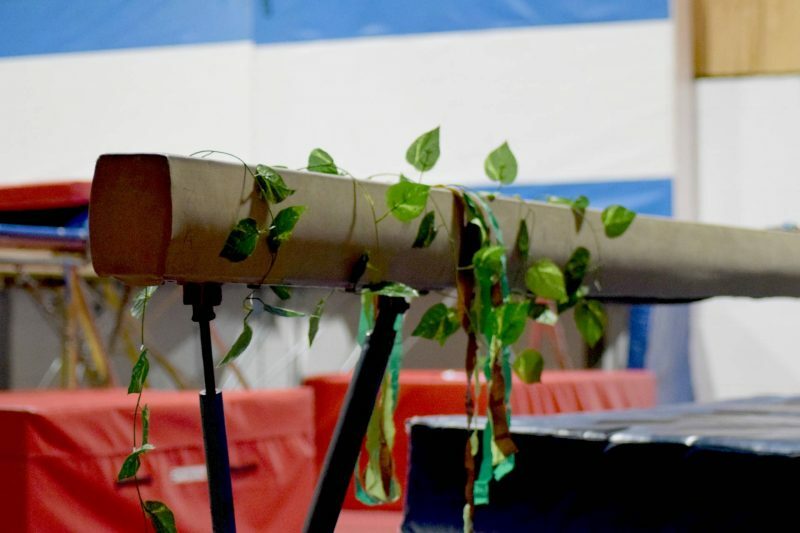 The vault section of the class included the children pretending to be butterflies and dancing across the mats whilst using brightly coloured material as wings and jumping over coloured ‘snakes’ before running up to a spring board and jumping onto the box. They’re also show how to finish properly and give a courtesy ‘ta dah’ ( which has been repeated MANY times at home). Next on to the bar section. 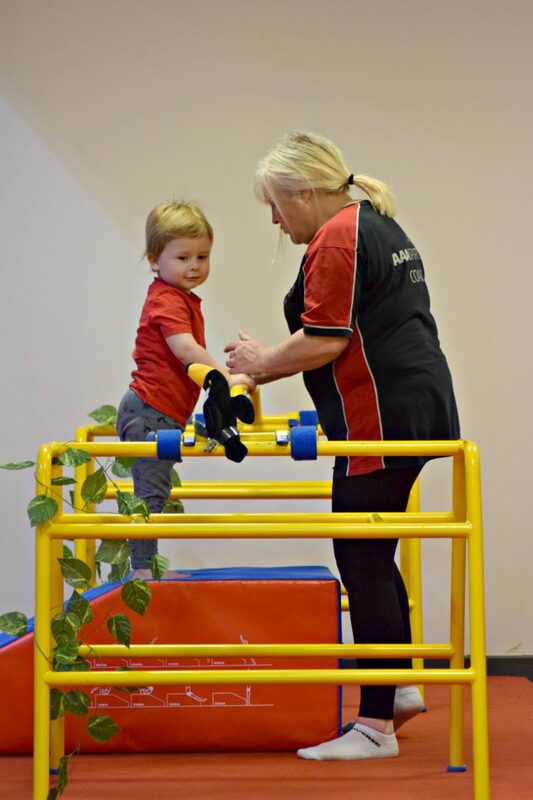 The activities in this section included hanging from the bar and tucking their legs up properly and climb a ramp and hold onto a bar, using their upper body strength to hold themselves up. The little man was very impressed that he could hold himself up using his arms. The last area that the class covered was beam. I think this was the little mans favourite. The activities included walking across the high beam and balancing over the ‘crocodile infested water’ below, and pulling himself along a wooden bench using just his arms, pretending to be a snake. 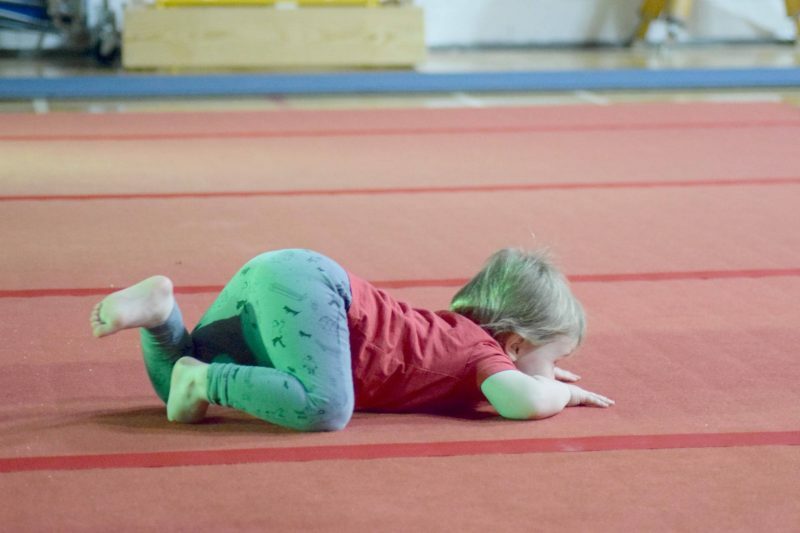 Pre School gymnastics seems like a great way to get your child into sports without too much emphasis on competition. The children can work towards awards but the challenge seems to be upon themselves rather than against others. From a parents point of view, I liked the the structure of the class, the children have lots of fun but have to follow rules and listen to the instructions the coach gives. I think it encourages discipline without being too strict. I like that not only are the classes encouraging fitness, they’re still encouraging the use of imagination. The class lasted an hour which went surprisingly quickly and all of the children appeared to enjoy it, especially the little man. He was asking to return before we’d even left the building. 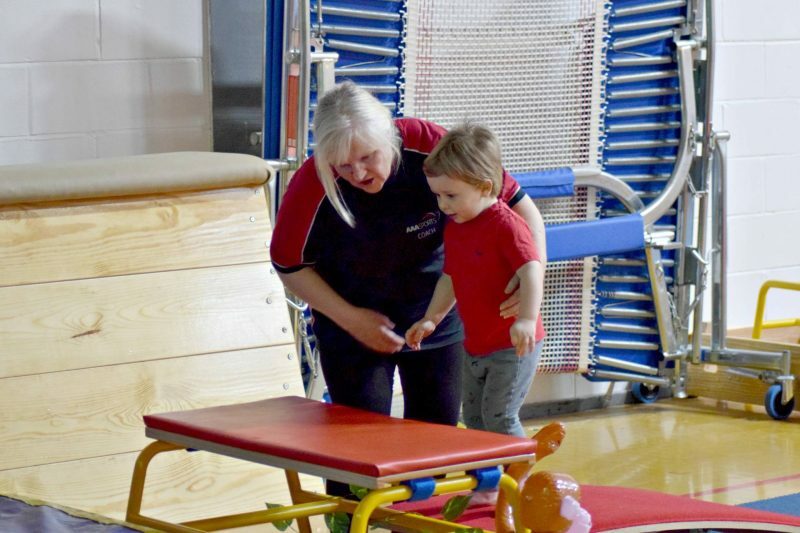 The classes are aimed at children aged 2 and a half and upwards – right up until Reception age. As well as offering regular and varied classes, AAASports also offer unique children’s parties. One of which, one of my luck blog readers can win! To enter, please complete the Gleam form below. The prize consists of a £150 party for up to 20 children in the AAASports gym at Sunderland. The party will last for one hour and includes a choice of activities and then 40 minutes in the party room.The party will need to be taken by 31st August 2017 and is the date subject to availability. Details and activities to be discussed and arranged directly with AAA Sports. The prize is offered and provided by AAASports who have the right to terminate or withdraw at any time. The winner will have 28 days to reply to the winning email/tweet otherwise another winner will be chosen. Any entrants found to have cheated in any way will have all entries disqualified. I have not been compensated for running this competition.